Victor Gibson Medal | Federation of Wine and Food Societies of Australia Inc. 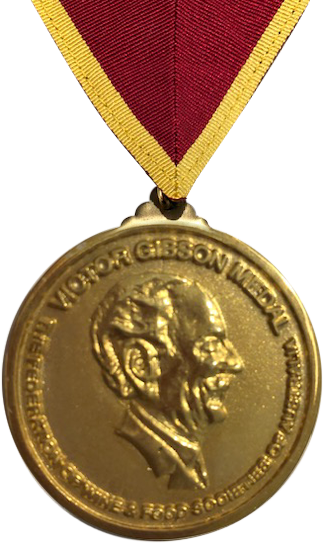 The Victor Gibson Medal is the highest honour awarded by the FWFSA. It is awarded for especially distinguished or meritorious service to the FWFSA, or to a cause or art which the Federation supports. As it is our highest award, it is not awarded at a specific time. When the FWFSA Executive receives a recommendation, it is considered against a number of award criteria. A recipient of this prestigious award receives the Victor Gibson Medal, which can be worn at appropriate functions held by the FWFSA and its constituent members. They also receive a plaque, designed to be displayed on either a desk or wall. Awarded at the Warrnambool Victor Gibson Dinner in 2013. Barbara has supported the Ladies WFS of Melbourne for almost three decades, serving on their Committee in a variety of roles including as President. Barbara has been involved with the Federation since 1995, holding a variety of roles on the Executive Committee. including serving as President from 2008 to 2010, a position she carried out with great dedication and enthusiasm. Awarded March 6th 2009 in recognition of his distinguished service to the WFS NSW over many years, his services as wine master for three conventions, 1980, 1988 and 2000 and for furthering the aims of the FWFSA. Awarded on 11th February 2007 for outstanding and dedicated service to the FWFSA in his two terms as President, ten years of Executive service, and 36 years of service to the Wine & Food Society of Portland & District. Awarded in 2002 for outstanding and dedicated service to the WFSA (now the FWFSA) and the New South Wales Society over a period of forty four years. Awarded at the fifteenth Victor Gibson Dinner in Adelaide on March 17th 2001 in recognition of his distinguished service to The Federation. Having served as Secretary/Treasurer since 1992 and editor of EPICURIO since 2000. Awarded at the seventeenth Annual Convention in Sydney on March 4th 2000 in recognition of his distinguished service to The Federation of Wine & Food Societies of Australia, having served on the Executive since 1989, as President for two terms, and Foundation Editor of Epicurio. He was also instrumental in the Tasmanian Societies conducting the 1998 FWFSA Convention in Launceston and Hobart. Presented at the fifteenth National Convention at Mildura on March 20th 1996 for distinguished services to The Wine & Food Society of Australia as its Vice President for three terms, organiser of the South Australian Post Convention Tour to the sixth National Convention, March 1980, and Chairman of both the thirteenth National Convention held in Adelaide in October 1992, and the fourteenth National Convention held in Port Douglas, September 1994. Presented at the second Victor Gibson Commemorative Dinner in Warrnambool, November 7, 1991 for distinguished services as Chairman and Chief Executive Officer of the IWFS-WFSA International Triennial Convention held in Australia during 1980 and for the outstanding contribution made to the advancement of the Society during his two terms as President. For distinguished services as an Executive member of The Wine & Food Society of Australia since its formation, and for the outstanding contribution made to the development of the Society during his two terms as President. Presented at the Society’s sixth convention in Ballarat, March 17 1978. For distinguished services in the formation of the Society and as its first President. Presented at The Society’s Luncheon held in connection with the Annual General Meeting at Melbourne, March 22, 1975.